I really love coffee and trying new kinds is something I love to do to find out about more coffee and different brands. This coffee is very crisp and taste great of course I have to always have a ton of sweetener in it to drink it. 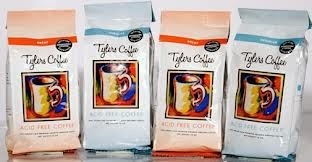 If you are a coffee lover and drink coffee you have to try Tylers Coffee anytime I am able to try another brand of coffee I jump at the chance. I have loved coffee since my first sip. By 14, coffee was already a major interest of mine. I loved the taste, the smell and, of course, that caffeine kick. My father, on the other hand, did not like coffee as it upset his stomach. Since by trade my father was a chemist, one day I asked him if he could make a coffee that we could both enjoy. This was the start of Tyler’s Coffee. After I sold the first couple of cases (going door to door on my bicycle), it was apparent how much a coffee like this was needed by all coffee lovers. I continued selling the coffee to friends, family and neighbors, and everyone eventually started calling it Tylerís Coffee. From there Tylerís was born, and not long afterwards, the official “Tylers’ Coffee” was born. My love and passion for coffee is still just as strong to this day — I just know more now. My commitment to you is this: We produce our coffee as naturally as possible. We use only the highest quality of ingredients available. Nothing is more satisfying than producing a quality product except maybe drinking that quality product, so we will never use anything less than the best. I guarantee you will not find another coffee like Tylers’ Coffee, with such superb flavor and quality, unmatched deliciously smooth flavor and, best of all, no bitter after-bite. Over the years, my love and passion for coffee has grown from an amateur’s interest to a professional focus. Now with a full warehouse, my team and I are redefining the way the world views coffee! We offer you a healthy option, one that will help your body instead of harm it. Drink Different. Drink Smart. Drink Tylers.